THE EXISTENCE GAME, by Judy Adams, is the story of 29-year-old Alex Moser’s battle for sanity following childhood sexual abuse. THE EXISTENCE GAME arrives at a timely moment when organizations from youth clubs to churches and schools are being exposed as places where children are at risk from sexual predators. As each new horrible story explodes in the news, waves of individuals are coming out with their own personal stories of childhood hell. While statistics vary somewhat, it appears that approximately one in four girls and one in seven boys in America experience sexual abuse before reaching adulthood. According to Childhelp.org about 80% of 21 year-olds who were abused as children meet the criteria for at least one psychological disorder. THE EXISTENCE GAME – Meet Alex Moser. Her friends find her fun, sharp, and attractive. Her therapist knows she is terribly ill. Although few realize it, Alex is barely keeping her head above water. Plagued since childhood with numerous phobias, Alex has designed a life for herself in service to her fears. She works nights because she can’t sleep when it’s dark out. She owns two months’ worth of clothing because she can’t do laundry in her foreboding basement. Her windows are nailed shut and she sleeps in multiple layers of clothing, which she views as protective armor. And a voice keeps telling her she’d feel better if she were dead. Enter – Jonathan Frank, renowned Psychiatrist in Chief at a prominent psychiatric hospital, and a man fascinated with the complexities of the human mind. Dr. Frank can’t resist a challenge and Alex Moser, diagnosed with Borderline Personality Disorder, is challenging in every way. While this story offers a serious portrayal of mental illness and recovery, humorous anecdotes from the Irish pub where Alex works abound. From a police officer who drunkenly believes himself to be Superman to a pub owner whose hands-off approach leaves people wondering how he stays in business, there is no shortage of comic relief and characters who are well worth getting to know. JUDY ADAMS’ debut novel chronicles the first two months in Alex’s journey back to health, balancing humor and sadness with great skill and making for a truly inspirational and satisfying read. Dog Ear Publishing releases “Disney’s Dream Weavers: The Visionaries Who Helped Create Disneyland, Freedomland, the 1964-1965 New York World’s Fair and Walt Disney World – and the Ties that Bind Them” by Chuck Schmidt. A longtime Disney enthusiast uses his journalism skills to write a brief history of four intertwined amusement parks in this new book released by Dog Ear Publishing. This intriguing work includes information on attractions and the people who created them. Four plots of desolate land – an ex-orange grove, soggy field near a busy city, former dump and alligator-infested swampland – didn’t have much going for them until someone with vision turned them into wonderlands. This new book details a common thread that runs through entertainment venues decades apart: Disneyland in California, Walt Disney World in Florida, Freedomland in the Bronx and the 1964-65 New York World’s Fair in Queens. That common thread includes C.V. Wood, general manager of Disneyland, who went on to create his own vision – Freedomland, a U.S. history-themed park. The author visited them all. “Disney’s Dream Weavers” weaves a tale of beloved theme parks, starting with Disneyland, the world’s first theme park, which opened in 1955. Wood worked with Disney to make the park a reality. After Wood left Disney under less-than-idea circumstances, he built Freedomland. The world’s fair highlighted another aspect of Disney: the company’s state-of-the-art Audio-Animatronics technology. Another Disney employee, Van Arsdale France, who developed customer service training programs and handled traffic during Disneyland’s opening, did similar tasks at Freedomland. He also created training guidelines for the It’s a Small World workers at the World’s Fair and for future employees at Walt Disney World. The author’s memories take readers back to such attractions as Freedomland’s horseless carriage ride, elaborate Civil War scenes and a stagecoach robbery; the World’s Fair’s stunning Ford Motor Company’s Magic Skyway and Great Moments with Mr. Lincoln, featuring a life-like figure standing and speaking; the monorail ride leading to Disney World and the character-shaped topiary; and the Magic Kingdom at Disneyland. The book pays homage to those working behind the scenes to create parks that live on in memories as well as those still attracting tourists today. Photos, most of them from the author’s own albums, bring the parks to life once again. Award-winning journalist Chuck Schmidt has covered several major Disney events, including Walt Disney World’s 15th and 25th anniversaries, christenings of the Disney Cruise Line’s Dream (2011) and Fantasy (2012) ocean liners and Disney’s Animal Kingdom Park’s grand opening in 1998. He shares his passion for Disney in his blog Goofy about Disney on www.SILive.com. He and his wife, Janet, have three children and three grandchildren. For additional information, please visit www.BooksbyChuckSchmidt.com. Dog Ear Publishing releases “The Long Journey Home” by Brian R. Ellig. This new nonfiction release published by Dog Ear Publishing shares the joy that nature and the art of angling brought to a man facing his life’s stresses. Author Brian Ellig’s introduction to fly fishing started him down a life-changing path that would change his perspective through the many challenges he faced. Author Brian R. Ellig’s love affair with fly fishing started in April 1992 on a quiet little trout stream called Slippery Rock Creek. Ellig’s friend and business associate Keith Yenets introduced Ellig to the hobby when Ellig was on contract assignment at the Beaver Valley Power Station. Ellig’s work as a contracted procurement professional for many different fossil power and nuclear power generation projects was stressful, and Ellig found himself shifted around the country to various power facilities; the peace and solitude of fly fishing spoke to a part of Ellig that had never been reached before, and he was hooked. This trip to the stream effectively changed Ellig’s life forever. As Ellig’s work took him to New York, his love for the rod and reel persisted. Through a brutal commute and the tragedy of September 11, 2001, Ellig’s time on the water provided him tranquility and time for contemplation. During this time, Ellig thought at length about his career-ending knee injury that cut his basketball career tragically short, ending his longtime dream of playing professionally. This same injury later required Ellig to undergo major surgery, resulting in a total knee replacement. However, even surgery couldn’t keep Ellig from his beloved hobby for long. With his wife, Karol, and their beloved dogs, Ellig eventually made his way to his native state, where he could pursue his passion. The Long Journey Home is the story of an average man’s search for his deeply-buried sense of self, and the experiences that helped him to bring this forth. Ellig’s description of the contemplative nature of fly fishing will leave the reader longing to have a rod in hand in the middle of a calm stream. Author Brian R. Ellig recently retired from a 37-year career in procurement encompassing the construction and operational support of nuclear and power-generation facilities; this position allowed him to travel across the country with his wife, Karol, and their beloved dogs. An avid fly fisherman, Ellig enjoys collecting vintage fly fishing books. For additional information, please visit www.FlyFishingMyOnePassion.com. Dog Ear Publishing releases “46 Year Old Twin Virgins of America Speak Out: Poetic Letters to a Nation” by Fodeliah and Fidencia Castro Del Ruz. Twin sisters turn to poetry to expose abuse and violence and explore solutions in this new book released by Dog Ear Publishing. Two women use their poetry to focus attention on issues such as abuse and violence against women. This new book features poetic letters that aim to reveal personal experiences and push for change in individuals and society as a whole. The book’s final pages include the authors’ “prescription” for change in government that would lead to better laws to punish those responsible for what they call sexual reproductive terrorism, financial terrorism, emotional terrorism, mental terrorism, physical terrorism and religious terrorism. In “46 Year Old Twin Virgins of America Speak Out: Poetic Letters to a Nation,” the authors use beautiful turns of phrase to portray the ugliness of abuse. In “Who Am I,” for instance, the narrator writes “I would never know I could be tomorrow’s child with an injury. Turned from within upside down; forced to confront the defect within, fearful of what as yet to come.” The selection “My Body” offers spirited words of resistance: “The life of my body is mines created by god, Stars of the universe’ slaves we are not!” Stunning photographs pair beautifully with the poetry, serving as visual representations of the emotions the letters evoke. Author Fodeliah Castro Del Ruz is an artist and entrepreneur. Author Fidencia Castro Del Ruz, a military veteran, also is an artist. Both live in Charlotte. For additional information, please visit www.46yearoldvirgins.com. 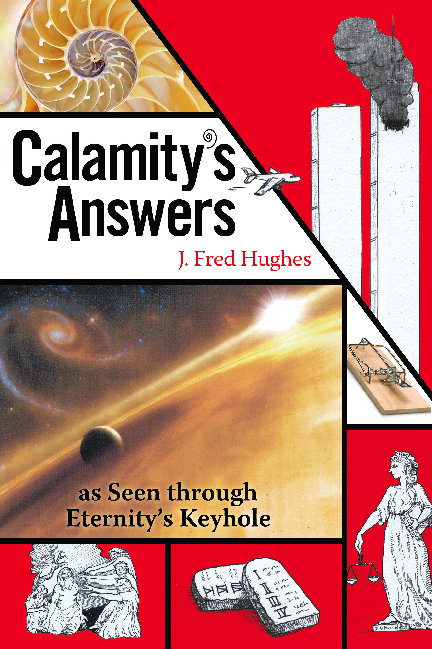 Dog Ear Publishing releases “Calamity’s Answers as Seen through Eternity’s Keyhole” by J. Fred Hughes. A pastor who has suffered his own tragedies explores what he calls God’s freedoms to humanity in this new book released by Dog Ear Publishing. He refutes theology that pins blame on God for pain and disasters. “Calamity’s Answers as Seen through Eternity’s Keyhole” saw its beginnings in the sudden death of a young girl well-versed in the Bible who served as a substitute speaker at one of Hughes’ churches. The devastating grief that followed – and the author’s disagreement with Harold Kushner’s conclusions in his book “When Bad Things Happen to Good People” – led Hughes to research more fully the revelations of the cross, God’s ultimate expression of love. He also turned to the book of Job, a long-suffering, faithful man, which presents information about the conflict between God and Satan, the importance of having faith and integrity during hard times, and the nature of God’s character and how it differs from “pop” theology. Hughes points out that God offers all created beings freedom of choice, whether honoring God or rebelling, and has allowed the battle between good and evil to develop within limits of time, with evil getting worse and goodness becoming closer to the Christ-like ideal. When crisis strikes, those with little or no faith easily turn to God when pointing the finger of blame. Hughes’ provocative book ultimately presents new ways of thinking about God and faith to ease the ache of calamity. Author J. Fred Hughes earned a degree in mechanical engineering and worked for a manufacturing plant producing 105mm shells for the Navy’s four-inch guns. After studying for a year with a pastor, Hughes quit his engineering job and studied first at a missionary college in Takoma Park, Md. He also was accepted to study theology at Potomac University in Washington, D.C. He went on to pastor at various churches. Krista Eddy created the line drawings that illustrate the book. For additional information, please visit www.isgodtoblame.com. 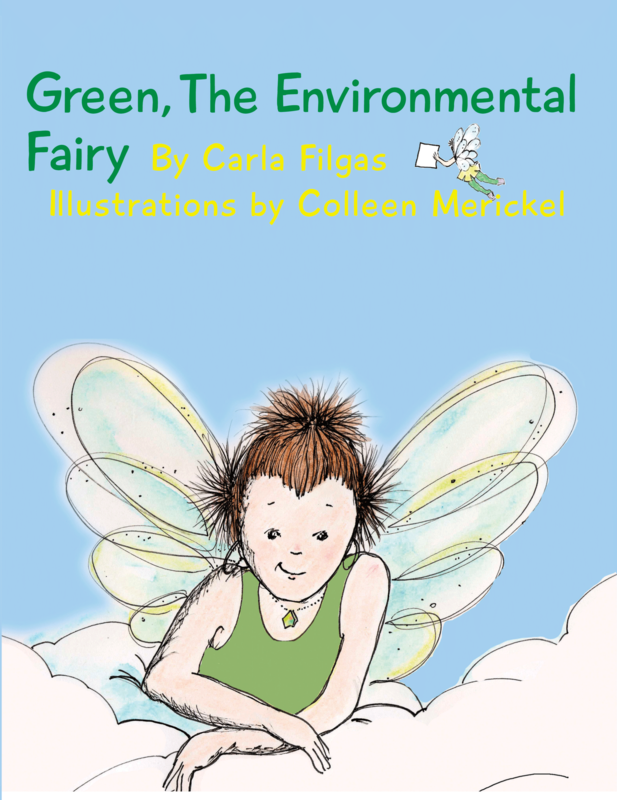 Dog Ear Publishing releases “Green, the Environmental Fairy” by Carla Filgas. A six-inch fairy finds a job she can be passionate about – helping save the damaged planet – in this new children’s picture book released by Dog Ear Publishing. A young fairy wants a job – work she will enjoy just like other fairies she knows: Cinderella’s fairy godmother, Pinocchio’s Blue Fairy and Peter Pan’s Tinkerbell. As this charming new children’s book reveals, however, even the Fairy Job Fair proves a disappointment, with everyone else taking the positions she wants. Luckily, the Boss of All Fairies has just the job for her – helping the world become a better place for everyone. Even her name will reflect the importance of her role: Green. “Green, the Environmental Fairy” shadows Green as she grows into her job, charged with the task of saving the world. She gains the gift of writing words of conscience on magic fairy sticky notes that, when applied to children’s foreheads, cause them to wake up to a new way of thinking. Green is a natural for the job because she’s recycled and reused items for years, including making herself a tutu out of the top of a butter container and shoes from discarded toothpaste caps. Right from the start, she begins to work her magic. Families can enjoy reading this imaginative story aloud. The author’s gentle lessons about recycling, reusing and conservation pair perfectly with illustrator Colleen Merickel’s tender drawings. A helpful list of environmental tips for families – from turning off the faucet while brushing their teeth, to getting friends together to clean a creek – provides concrete ways to join Green in her conservation efforts. For additional information, please visit www.greentheenvironmentalfairy.com. Dog Ear Publishing releases “Millie & Honey, the Incredible Instantaneous Interplanetary Adventure Vol. II: Appleopolis” by J.D. Means. A family, a mother dog and her children travel to an interactive planet in this new children’s book released by Dog Ear Publishing. 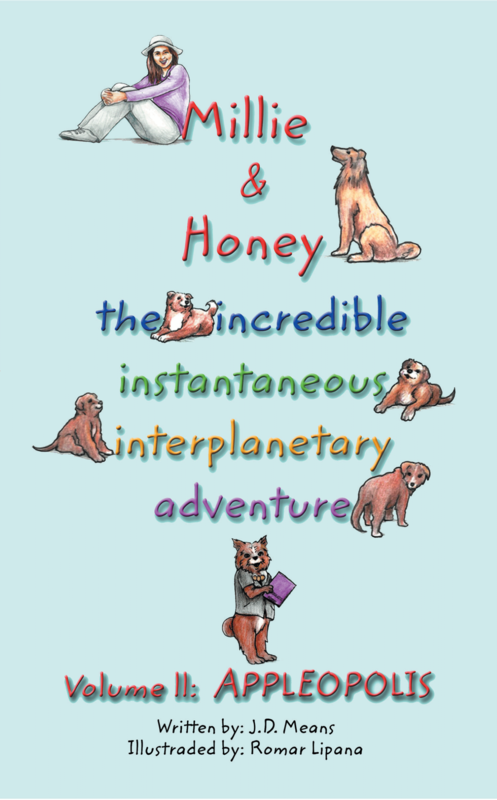 Honey, a dark brown Collie and Labrador mix, and 14-year-old Millie continue their adventurous travels in this new children’s book, a sequel to “Millie & Honey, the Incredible Instantaneous Interplanetary Adventure Vol. I: Catatonia.” Millie, Honey, Millie’s parents and Honey’s litter board a traveling machine they won in a raffle while on their previous adventure, heading to the planet Appleopolis, a planet of intelligent trees. They’re soon on the way to another incredible adventure. In “Millie & Honey, the Incredible Instantaneous Interplanetary Adventure Vol. II: Appleopolis,” the travelers meet Rags, the Regent of the Agricultural Garden Society, a colorful Yorkshire Terrier who talks like a pirate. He becomes their tour guide to Appleopolis, which features apple bobbing with a twist, the maple forest and the cinnamon grove. But the best part is visitors can interact with the plants and animals, hearing their thoughts telepathically. Meadows turn into choirs as the grass blades thank the sun for its light. When their Appleopolis adventure ends, the crew finds a way to take a little part of the planet home. The characters’ love for each other and their adventure is infectious. The book works well for both young readers and family read-aloud sessions. Black and white line drawings by illustrator Romar Lipana enhance this fun-filled journey to another world. Author J.D. Means lives in Dubai, UAE, with his wife, Rose, the real-life Honey, and a dog named Rags. Means is already working on the third book in the series. Illustrator Romar Lipana is working in Dubai.